Computers were hot in the ’80s. Time Magazine named the computer as its newsmaker of the year for 1982. There was widespread growth of computers in schools. A survey by Quality Education Data in early 1983 found that 48% of schools had them. Of course, the data said nothing about how many computers each school had. It also didn’t tell how well they were used. Schools created computer literacy plans to increase awareness of the machines’ potential and developed a command of the skills needed to use them. Educators knew that there had to be more than learning about the machines and basic programming. They tried to figure out how to leverage the capabilities of computers to help students learn in new ways. The answer was educational software. Subject area teachers found there was something for everyone. Let’s take a trip down memory lane. Teachers adopted practical applications, such as typing programs, LOGO for logical thinking, and drill and practice in various subject areas, particularly math and spelling. Problem-solving programs, such as Rocky’s Boots and Gertrude’s Puzzles, creative software, such as Paint, and simulations, such as Survival Math and Volcanoes, were popular. Language arts teachers adopted spelling, vocabulary, and reading programs. Word processors such as Bank Street Writer were popular. In 1984, as a computer specialist with the New York City Board of Education, I taught other educators how to use word processors to teach writing skills. Social studies teachers used games, such as “Where in the World is Carmen Sandiego?” and simulations, such as “Oregon Trail,” “Cross Country USA,” and “The Other Side,” to teach geography and problem-solving skills. My favorite science software was a frog dissection simulation. The advantage it had over the real thing (in addition to not being gross) was that students could put the frog back together and, if they did it correctly, the frog got up and danced on the dissecting table. If a teacher dreamed of software that didn’t exist, he or she could create it. By 1985, you didn’t have to know programming to do this. Authoring programs made it possible to write your own software that included graphics and sound effects. Through the ’80s, software titles expanded from classroom applications to grade books, SAT preparation, desktop publishing, and using business software both for learning and management. The emphasis continued to be on curriculum integration and by 1988, 97% of schools had at least one computer. As software’s capabilities and sophistication grew, educators who used computers had more options. The 1989-90 top five Classroom Computer Learning Software Awards went to IBM Mathematics Exploration Toolkit, World Geography, The Children’s Writing and Publishing Center, Microsoft Works 2.0 for the Mac Plus: Class in a Box 7-12, and Reading Realities: Real Life Issues. (For image: See Nov/Dec 1989, page 14). In case you think we’ve forgotten about hardware, the big four selling to schools were Apple Computer, IBM Corp., Tandy/Radio Shack, and Commodore, but clones had a place too. Products like Headstart Explorer, an IBM-compatible, offered a user-friendly graphical desktop interface, and the Laser 128 was Apple compatible. And remember the Black Apple? 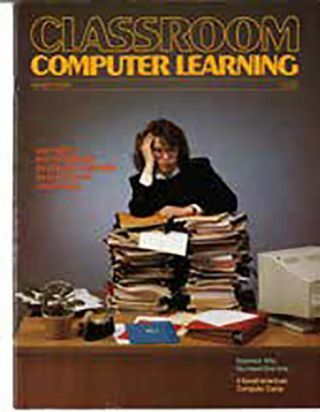 As computers gained popularity, administrators worried that classroom use wasn’t widespread or effective enough and funding for this costly investment would dry up. They wanted all teachers, not just the early adopters, to tap into the machines’ relevance. Professional development opportunities grew and research accompanied this drive for justification. As the decade drew to a close, Classroom Computer Learning would reflect the changes in thinking and became Technology & Learning. By then, according to the research firm Talmis, there were more than 2 million computers in schools. Gwen Solomon has been involved with edtech since 1984 as a NYC educator, computer specialist and Director of the School of the Future. She was senior analyst at the US Dept of Education, Director of the Well Connected Educator, and is the author of several books on edtech, including Web 2.0: how to for educators. She has been a contributing editor for Tech & Learning since 1998.